PRINCETON, NJ -- Underemployment rates were lowest -- below 12% -- in North and South Dakota in 2011. A group of five states, including two of the most populous, California and Florida, had the highest underemployment rates in the country -- 21% or higher. Gallup classifies respondents as "underemployed" if they are either unemployed or are employed part time (fewer than 30 hours per week) and wish to be employed full time. Gallup's definition of unemployment closely follows the U.S. government's definition; respondents are "unemployed" if they don't have a job, and are actively looking for work and available to begin work. Gallup reports underemployment by state in the following ranges: 6.0%-11.9%, 12.0%-14.9%, 15.0%-17.9%, 18.0%-20.9%, and 21.0%-24.0%. Nationally, 18.6% of Americans were underemployed in 2011, a slight improvement from 18.9% in 2010. However, these annual averages obscure significant seasonal variations. In 2011, underemployment reached as low as 17.8% in October, and as high as 19.9% in February. There are striking state-by-state differences as well. The Dakotas stand apart as having the best employment picture in the country in 2011, followed by nine other states in the 12%-14.9% range, seven of which are in the Midwest or West. These include Wyoming, Iowa, Nebraska, Montana, Minnesota, Oklahoma, and Kansas. The other two states in this range are Hawaii and the lone Eastern state, Vermont. At the other end of the spectrum, the five states where underemployment is highest have little geographic homogeneity, ranging from California in the far West to Florida in the Southeast, with Nevada, Mississippi, and Michigan in between. Full data for each state are available on page 2. Underemployment is not necessarily related to state-by-state patterns of economic confidence. In North Dakota's case, the positive underemployment situation does appear to translate into high economic confidence, given that the state in 2011 was second only to the District of Columbia on Gallup's Economic Confidence Index. On the other hand, Montana is in the second-best group of states based on their underemployment rates, but is tied for the third-worst Economic Confidence Index score of any state. West Virginia, which is dead last on economic confidence, is in the middle of the list of states based on underemployment rates. 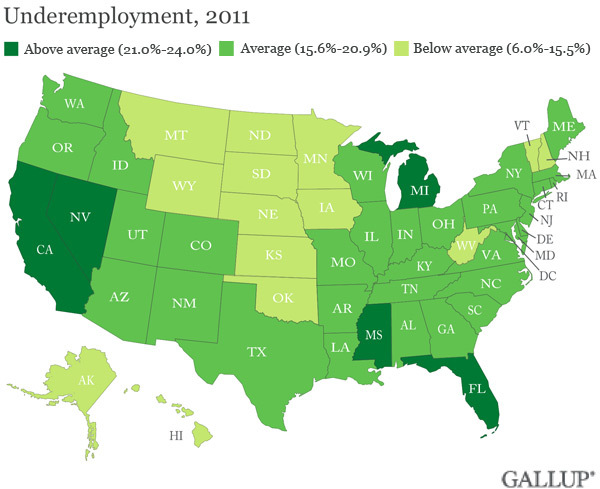 Gallup's state-by-state analysis of underemployment in 2011 reinforces the conclusion that not all states are created equal when it comes to the economy. Residents of the two Dakotas and a number of other Midwestern and Western states, along with Vermont and Hawaii, enjoyed relatively low underemployment rates last year. On the other hand, residents of California, Florida, Nevada, Mississippi, and Michigan suffered, with many more residents of those states either unemployed or working part time but wanting full-time jobs. Results are based on telephone interviews conducted as part of Gallup Daily tracking January-December, 2011, with a random sample of 214,822 adults, aged 18 and older, living in all 50 U.S. states and the District of Columbia. Margins of error for individual states are no greater than ±5 percentage points, and are ±3 percentage points in most states. The margin of error for the District of Columbia is ±5 percentage points. North Dakota workers were most likely to report their employers were hiring workers rather than letting workers go in 2011. All states showed positive scores on Gallup's Job Creation Index, with Rhode Island's +4 the lowest.